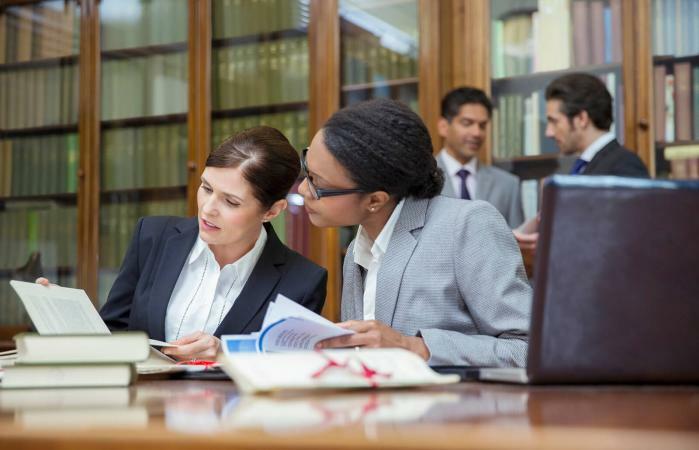 Paralegals, sometimes referred to as legal assistants, provide important services that help attorneys prepare cases for the courtroom and perform other law-related work on behalf of their clients or firms. Whether you are considering entering this field of employment or if you are a hiring manager, reviewing a sample job description can be a helpful research tool. To access a sample job description for a paralegal or legal assistant, simply click the image. Doing so will launch a complete position description that includes typical job duties, skills/qualifications and physical requirements. The document will open as a customizable PDF file that you can save for later reference. It is designed to provide an overview of the scope and range of duties often associated with working as a paralegal or legal assistant. 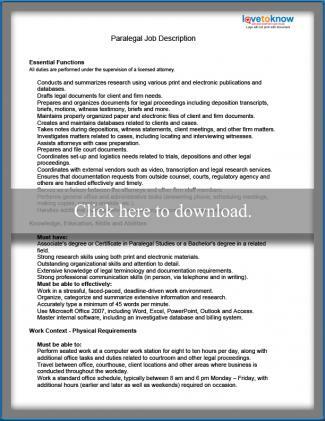 Download a paralegal job description. For those conducting research for the purpose of creating job descriptions specific to their own hiring needs, the document can be edited easily. Simply save it to your computer's hard drive or other storage device using the diskette icon in the toolbar before you begin to make changes. Once that has been done, click on the text area for any existing line to make wording adjustments. For assistance with downloading, saving, or using printable pdf files, use this handy guide to working with and troubleshooting Adobe files. When you are satisfied with the changes, save again. Use the printer icon when you are ready to print. While there are likely some similarities among paralegal positions, specific requirements vary by company. They may even vary among departments within a law firm - for example a paralegal who works in criminal law will likely perform different tasks than one who works in corporate law. This sample provides a good way to get a general idea of what is usually included, but expect to see differences when searching for a job or mapping out duties for your organization.